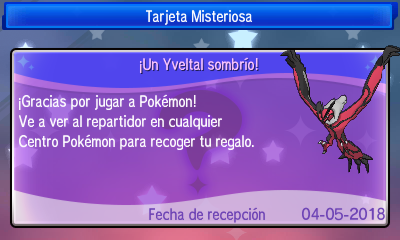 This event was given away to commemorate The Year of Legendary Pokémon via Serial Code. The gift received between Pokémon Sun & Moon and Pokémon Ultra Sun & Ultra Moon will slightly differ, in areas such as held item, level and moveset. 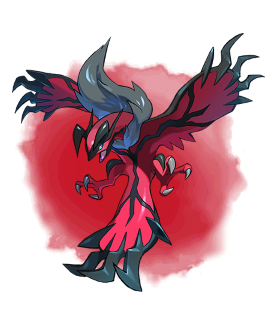 This Yveltal can only be received on Pokémon Sun & Ultra Sun, contrasting the fact that it is normally able to be encountered in the Ultra Space Wilds of Pokémon Ultra Moon. 0x2C Thank you for playing Pokémon! Please pick up your gift from the deliveryman in any Pokémon Center. Ala Mortífera y Pulso Umbrío.